NOW REDUCED AS OWNER MEETS THE MARKET!! A fantastic package, this is a yacht that has comfortable quality accommodation for 6 in private cabins, easily handled, performs well under motor PLUS sails well all presented in first class condition, a truly delightful boat, and an absolute credit to the current owner. A beautiful timber fitout, virtually unblemished, cockpit with teak floor and seats, again in as new condition plus gleaming decks and cabin etc, this is one of the best examples on the market today of these very popular cruiser/club racers. The fitout comprises two aft double cabins with good storage including hanging lockers, a large double vee berth n the for'ard cabin with direct access to the full bathroom ( acts as an ensuite). A great dinette arrangement with settee berths accommodating six people comfortably is mid-ships, with adjacent separate access to the bathroom. The table offers good seating flexibility too with folding sides. The galley has 3 burner gas stove with oven, double bowl stainless steel sink with hot/cold mixer tap plus large volume 12 volt fridge/freezer. Clever touches provide a very flexible working bench space too. The timber fitout is of high quality, including the teak/holly traditional look floor, not having the veneer look of other production brands. Boarding the boat from either a marina or dinghy is an easy step onto the swim platform transform, then direct access into the cockpit, moving easily past the large wheel and pedestal. The cockpit seats allow for up to eight to relax comfortably or good space for a twilight race crew. The boat is very well appointed with quality Harken deck gear, including self-tailing winches, cabin top jammers, adjustable genoa cars and all lead aft to operate from the cockpit, making the boat very easily managed short handed. Auxiliary power is from a 3 cylinder 30hp Volvo diesel sail-drive with fantastic all round access, allowing an easy 6 knots under motor. Again the motor presents in an as new condition. The electronics are extensive with a new Raymarine Axiom Plotter at the helm, new TMQ AP4 Autopilot and more.. The sails have also been recently upgraded too with a new main in 2017 and furling headsail in 2016. 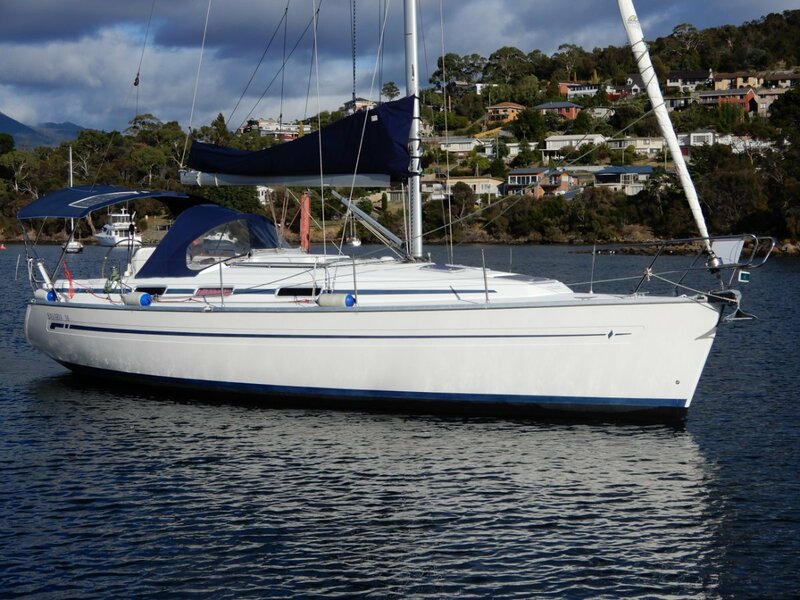 A great opportunity to just step aboard and sail away, NOW REDUCED and with a genuine reason for selling, please call John Radonic on 0459 322 862 for more information.